There are several colors which have come to be strongly associated with the Good Neighbors over time and today I want to discuss them. Generally they are related to us through descriptions of clothing and of animals, although by far the most detail can be gleaned by looking at clothing descriptions. The clothing itself when described in stories is usually similar to that of the people living in the area although sometimes a bit out of date in style (Briggs, 1976; Yeats, 1893; Kirk, 1891). The colors may be interpreted as symbolic or simply as representing widespread preferences by the Fair Folk. Green - Green is probably the most well known of fairy colors. Several euphemisms for the fairies in different areas are based on the color green including Greenies and Greencoaties (Briggs, 1976). In some places, like parts of Scotland, it is so strongly associated with the fairies that it is considered unlucky for women in particular to wear green (Briggs, 1976). The Cu Síth of Scotland are said to have green fur. In many traditional descriptions fairies are described as wearing green; often they are said to wear green clothes and red hats, especially the Trooping fairies (Lysaght, 1991; Gwyndaf, 1991; Briggs, 1976). In other sources they are simply said to wear red and green (Bruford, 1991; Ballard, 1991; Evans-Wentz, 1911). In many cases green is said to be the primary color worn along with a touch of red, for example a fairy lady may wear a green dress with red slippers or a fairy man may wear a green outfit with a red feather in his hat (Briggs, 1976). In other descriptions given of fairies in folklore and anecdotes they are seen wearing green only (Evans-Wents, 1911). In many descriptions of the Queen of Fairy, such as we see for example in Thomas the Rhymer, she is described as dressed richly and in green. Briggs relates green to the color of death in Celtic folklore (Briggs, 1976, p109). In contrast however Evans-Wentz suggests green is associated with renewal, rebirth, and immortality (Evans-Wents, 1911). The truth may be somewhere between the two, with the color having layered symbolism. 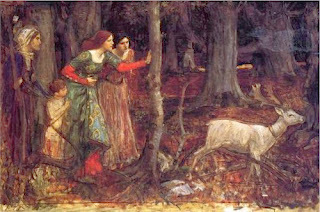 Red - Red has long been associated with the Otherworld and with Otherworldly beings in Irish mythology and in Fairylore. In Irish mythology when a figure appears who is described as 'red' or wearing all red they are almost invariably Otherworldly in nature, something we see in Togail Bruidne Dá Derga as well as the Táin Bó Regamna. Red in Irish mythology is a color associated with blood and more generally with death by violence; in the Tain Bo Cuiligne we can see an example of this in the prophecy given by Fedelm to Medb where the words 'forderg' [very red] and ruad [red] are used figuratively to indicate blood and bloodstains. Red hats are associated with fairies, not only the eponymously named Red Caps who dye their caps in blood, but many others as well. In folklore fairies are sometimes described as wearing green clothing and red hats (Lysaght, 1991). They may also appear dressed entirely in red, although this could be considered a bad omen, relating to an anecdotal tale of a red clad fairy who would appear at births to foretell the baby's death (Ballard, 1991). As well a woman who saw red clad fairies in Newfoundland was hit by elf shot from them (Rieti, 1991). Although this may indicate that red clad fairies are generally more dangerous, as with most things fairy related, it is not a a firm indication. Leprechauns, Cluricauns, and the Fir Darig were traditionally known to wear red clothes, and they could be either harmful or lucky depending on circumstances and how the person interacted with them (Briggs, 1976). White - In one Shetland account the fairies appeared as two opposing forces, one wearing white the other black (Bruford, 1991). A variety of fairies were known to wear white in particular and these included the Silkies (a type of English Brownie), the White Ladies, and the Tylwyth Teg (Briggs, 1976). Yeats related a tale of two boys who saw a white clad fairy figure circling a bush (Yeats, 1892) Isobel Gowdie described the Queen of Elfhame as wearing white as well. Many fairy animals are described as being white with red ears, and this includes cows, deer, and dogs. In Old Irish white was a color that among other things was associated with corpses of the battle dead which were described as bloodless. It was also said in some folklore that fairies had white blood, which was sometimes found on the ground after they had fought. Black - generally speaking an ill-omened color. To see a fairy wearing black was an omen of death, although not necessarily for the person seeing it (Ballard, 1991). A variety of fairy dogs and hounds are described as black in color, and these are usually - although not always, death omens. Black dogs are large and shaggy with flaming eyes, and in stories might be helpful or could be dangerous (Briggs, 1976). The cat sidhe are said to be black with a white spot on their chest. Blue - Manx fairies are described wearing blue, usually with red (Briggs, 1976). There was also a sighting of a fairy market at Blackdown where the fairies seen where noted to be wearing both the usual red and green as well as blue (Briggs, 1976). There is a type of hobgoblin in Somerset, called 'Blue Burches' who was known to wear blue pants from which he got his name, burches meaning britches, and similarly a fairy called 'Blue Bonnet' who was known to wear a blue hat and worked in mines (Briggs, 1976). Multicolors - there are also several sources that mention fairies wearing many colors, in the sense of a crowd of the Other Folk all arrayed in different colors, as well as particolored clothes or wearing plaids or tartans. One Welsh account of two brothers describes them seeing an assortment of smaller fairies dancing wearing many different colors (Gwyndaf, 1991). Scottish accounts going back to the 17th century describe some Highland fairies wearing plaids and this seems to be true into the modern period as well (Kirk, 1891; Briggs, 1976). There are also a scattering of accounts of colors not mentioned here because they seemed to be uncommon or unusual, such as yellow. We should not, therefore, assume that because certain colors are prevalent that they are necessarily restricted to these. It's also worth considering that while these colors are likely still powerful and significant to the Good People, were one to see them today they would most likely be dressed in fairly modern attire. Although they are occasionally seen in archaic dress they are more usually seen in clothes that are either slightly out of date or contemporary and as rev. Kirk, Yeats, and Briggs all noted usually in the styles of the same region they are appearing in. Yeats, W., (1893) Celtic Twilight. This is really interesting. The trees which have traditional otherworldly links - Rowan, yew and hawthorn - all have red berries. Do you think that is significant? Obviously it has something to do with where these colours lie on the colour spectrum and is related to harmonics. Like when stringed musical instruments can start a string on a nearby similar instrument resonating. We can only see a tiny fraction of the colour spectrum and the brain is "filling in" what it sees.